The Pilatus PC-7 Turbo Trainer is a low-wing tandem-seat training aircraft, manufactured by Pilatus Aircraft of Switzerland. 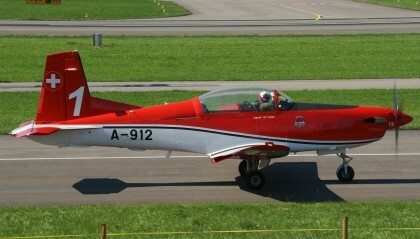 The aircraft is capable of all basic training functions including aerobatics, instrument, tactical and night flying. PC-7 Mk II is a development of the PC-9’s airframe and avionics, retaining the PC-7’s wing to mount external stores. Powered by PT6A-25C of 522 kW (700 shp) rather than more powerful PT6A-62 of PC-9.